States Lines Eastern Division, it was announced by William J. Kee- 1y, Eastern Division vice president of the company. East Coast freight activities, with the exception of sales. Mr. Pert, who will report to Mr.
Lines in 1956, he has held various managerial positions for company terminals in New York and Lon- don. Corp., a wholly owned subsidiary of Campbell' Industries (AMSE), has announced a construction con- tract for four Navy fuel barges totaling approximately $800,000. Tank and Fabricating Co. of' St.
YON (Yard Oil Non-self-propelled) fuel barges; They will be delivered to the Commander, Long Beach Na- val Shipyard, for harbor fuel trans- portation. The barges are of a new design in the .YON-245 class. Each will be capable of carrying- any of five dif- ferent varieties of fuel, with a. ca- pacity of up to 1,500 tons. The craft will be 165 feet long, 40 feet wide, and 11 feet high. October 1, 1974. The third and fourth will be delivered by January and February 1975. George E. Coorssen has 'been ap- pointed president and chief execu- tive officer of the Henschel Corpor- ation, of which he has been vice president and treasurer since 1949. H. Coorssen, who has been named chairman of the board. Signal Corporation and a leading maker of shipboard intercommuni- cations systems. 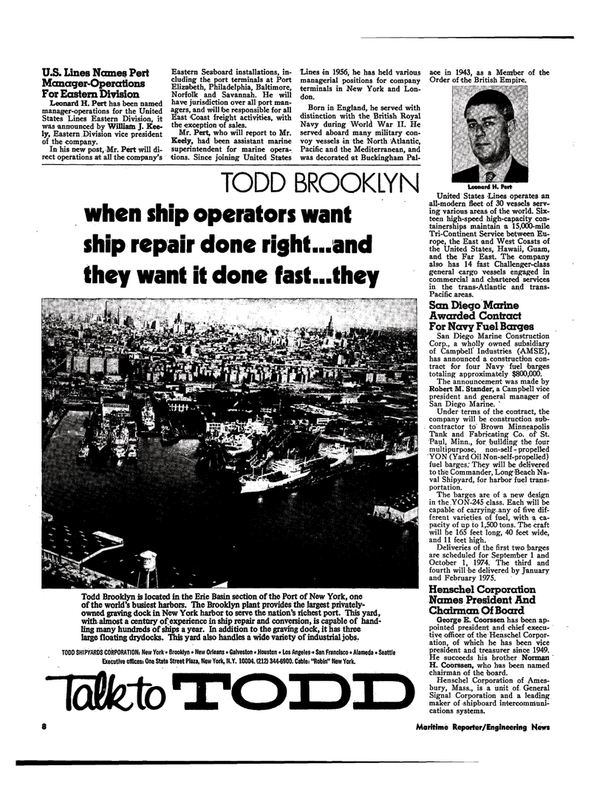 Todd Brooklyn is located in the Erie Basin section of the Port of New York, one of the world's busiest harbors. The Brooklyn plant provides the largest privately- owned graving dock in New York harbor to serve the nation's richest port. This yard, with almost a century of experience in ship repair and conversion, is capable of hand- ling many hundreds of ships a year. In addition to the graving dock, it has three large floating drydocks. This yard also handles a wide variety of industrial jobs.